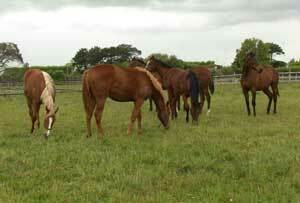 Yearling fillies used in the study at pasture. The bacterial community in the dung of horses fed a commercial forage-based feed transitioned rapidly once the animals were changed to a pasture-only diet, New Zealand research has shown. The bacterial community of the horses on the commercial diet, which comprised mainly ensiled lucerne and corn, became similar to that of a group which stayed on pasture throughout the experiment within four days of the feed change. The findings of the study, conducted by researchers from Massey University and AgResearch’s Grassland Research Centre, have been published in the open-access journal, PLoS ONE. The microbial community of the equine hindgut is sensitive to changes occurring in the gastrointestinal environment, with alterations in diet, the passage rate of food, and levels of pre-caecal starch digestion known to be important factors. Abrupt dietary changes, particularly the availability of fermentable starch and water-soluble carbohydrates, can upset the microbial populations in the hindgut and lead to issues such as hindgut acidosis, colic and laminitis. The researchers set about investigating the effects of the abrupt dietary transition on the faecal microbes of forage-fed horses over a three-week period. Six yearling thoroughbred fillies were fed exclusively on a commercial feed called FiberSure for three weeks before the study started. The feed was made up of 65 percent ensiled chaffed lucerne (alfalfa), 35 percent cracked maize (corn), and a vitamin and mineral premix with molasses. Another six fillies were kept on a pasture-only diet for three weeks. Dung samples were collected after the three weeks from all 12 horses, which were located on a commercial stud farm near Palmerston North. The six horses on the commercial diet were then abruptly moved to pasture. Karlette Fernandes and her colleagues investigated microbial changes in the faeces of yearling fillies following a dietary change from a commercial foraged-based feed to pasture. Both groups then continued to graze similar pasture for three weeks, with dung samples collected at four-day intervals. The samples were collected carefully from the facecal mass and snap frozen within two minutes of defecation to limit the possibility of environmental contamination. DNA was isolated and analysed to identify the microbial communities in the dung. The researchers found that there were differences between the two groups of horses initially in terms of the relative abundances of four genera – BF311 in the Bacteroidaceae family, CF231 in the Paraprevotellaceae family, and currently unclassified members within the order Clostridiales and within the family Lachnospiraceae. The bacterial community of commercially fed horses became similar to the pasture-fed group within four days of feeding on pasture, whereas the structure of the archaeal community remained constant before and after the dietary change, primary author Karlette Fernandes and her colleagues reported in the journal. Archaea are a kingdom of single-celled micro-organisims similar in size to bacteria. The community structure of the faecal microbiota – bacteria, archaea and ciliate protozoa – of the pasture-fed horses was also identified. The initial differences observed appeared to be linked to recent dietary history, with the bacterial community of the forage-fed horses responding rapidly to abrupt dietary change, they said. Forage-only diets are known to promote greater microbial stability, evident by the lower microbial counts and relative abundances of specific lactic-acid-producing bacteria. The researchers described the dietary challenge in the study as moderate and primarily forage-based. “The rapid change observed in the structure of the faecal bacterial community when horses were transitioned from feeding on an ensiled conserved forage-grain diet to pasture, and the subtle changes in the bacterial community structure observed when on pasture, emphasizes the sensitivity of the microbiota to changes in dietary substrate,” they said. They said the results indicated that the basal microbiota in the horse’s gut was highly diverse and primed to respond to acute dietary changes. They said the number of unclassified bacterial genera – 68 – detected in the study showed the lack of knowledge on the composition of the microbial populations. They suggested that further studies were warranted on the various microbial populations in the equine gut to expand knowledge in the area and to help understand their functional role in hindgut fermentation. None of the horses in the study showed signs of colic, laminitis, or digestive disturbances throughout the study period, or during the three weeks before the feed transition. “The findings of the present study indicate that the faecal bacterial community of yearling horses is highly diverse and the relative abundances of individual taxa change rapidly in response to changes in diet,” they reported. “The faecal microbiota of horses on a conserved forage-grain diet were similar to that of horses fed pasture in terms of species richness and diversity, and the structure of the archaeal communities, but differed significantly in terms of the relative abundances of distinct bacterial families and genera. Fernandes was joined in the research by Sandra Kittelmann, Christopher Rogers, Erica Gee, Charlotte Bolwell, Emma Bermingham and David Thomas.